In December 2017 the first in-house Christmas market took place at Aspen’s German-based Bad Oldesloe site. Due to the company’s social commitment an idea of combining this event with a fundraiser was quickly born. Numerous employees sold homemade Christmas articles, crepes and waffles at Christmas stands and donated the proceeds. The newly founded company choir performed a Christmas song medley and contributions quickly rose to 280 Euro. 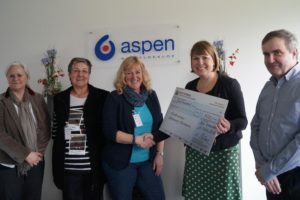 Aspen Bad Oldesloe appreciates the social commitment of its employees and the company rounded up the amount raised to 500 Euro. As part of a town hall with all employees on the 13th of March 2018, Susanne Blaue, HR manager, presented a symbolic cheque to Sabine Tiedtke, honorary Chairperson of the Lebensweg Stormarn Association and Maren Börner, honorary assessor. The proposal to donate to Lebensweg (translated – path of life) Stormarn came from our staff. “We were very happy about this, because as a company, we attach great importance to support facilities that can be used, for example, to take care of children, socially marginalised and needy groups,” said Susanne Blaue.